After we’ve poured out our heart ‘n soul into each and every jar and they’ve blessed us with their pop, pop, pop sound ~ proof of a good seal, we can go ahead and create cool labels for them. Over the years, our labels have progressed from tea stained hand stamped tags, to tags with ribbons and now my favorite…hand punched circles out of patterned papers which are glued onto the lid, and embellished with hand stamped lettering. Yes, it would probably be much easier for me to figure out how to do something crafty on the computer and purchase a working printer but that is just not my style. I’m an artist and I like the hands on approach. And besides, it only takes a few extra minutes to design a unique label to match the tasty contents we’ve poured into each jar. My belief is that everyone who is out there canning is creative! You are all coming up with your own unique recipes or putting your flare on existing ones so why not take a few moments to put your stamp on what you’ve put up!?! Here’s what we do and a few ideas to get your creative juices flowing. Keep on hand a collection of scrapbook paper, interesting newspaper articles, photographs, Christmas and Birthday cards, old and new maps, and whatever other paper pieces interest you. Reusing paper products like cards and newsprint is a great way to make cool labels and help the environment too. 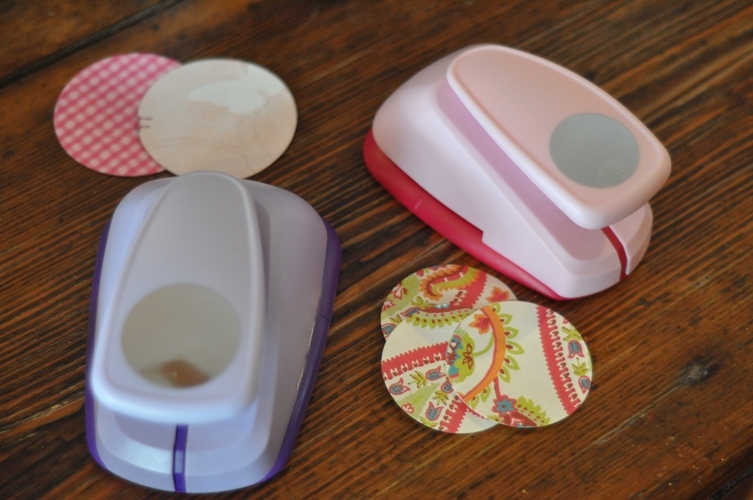 Purchase a 2 1/2″ and 3″ circle punch to fit the lids of your regular and wide mouth mason lids. You can use these punches to make your lid circles quickly and easily. They will set you back about $20-$30 each but it’s an investment that is well worth it in the long run. You can use these punches on your collection of papers or even on sticker paper (if you want to avoid the glue step). Large circle punches can be found at most craft stores. Purchase glue that will work with both paper and metal. Michaels has all sorts to choose from…we are using US Art Quest PPA (Perfect Paper Adhesive) in a matte finish. You only need a thin layer of glue, it doesn’t have an odor, and it dries clear. Lettering. This can be done using individual rubber stamps. Over the years, I’ve picked up several different alphabet stamps sets with unique fonts that I enjoy using to give our labels that personal touch. A great place to look for inexpensive hand stamp sets is at a dollar store. Here in Ontario, the Dollarama has a variety of sets all under $2-. But, for those of you who have a working printer and some computer savvy you may want to design a template for the 2 1/2″ and 3″ circle and print the lettering directly on your decorative or sticker paper. Then just use your large circle punches afterwards. We had lots of fun dressing up the beer jelly with the beer labels. 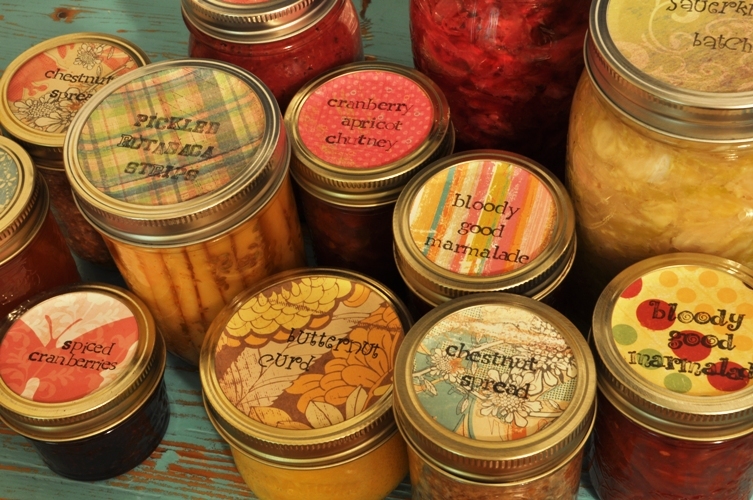 You could probably do something similiar with your farmers’ market preserves using fruit labels or cool old packaging. Just keep on the lookout for interesting papers that will co-ordinate with your contents. There are tons of cool canners out there who are creating beautiful labels using all sorts of different methods. Check out Lindsay’s labels at Uncanny Preserves , or Kaela’s detailed post about creating cool labels on the computer at Local Kitchen, or these neat hand embroidered jar tops from ha!ha!ha! flickr photos. And, if you don’t want to make your own consider purchasing some of these sweet labels from Mud & Twig. 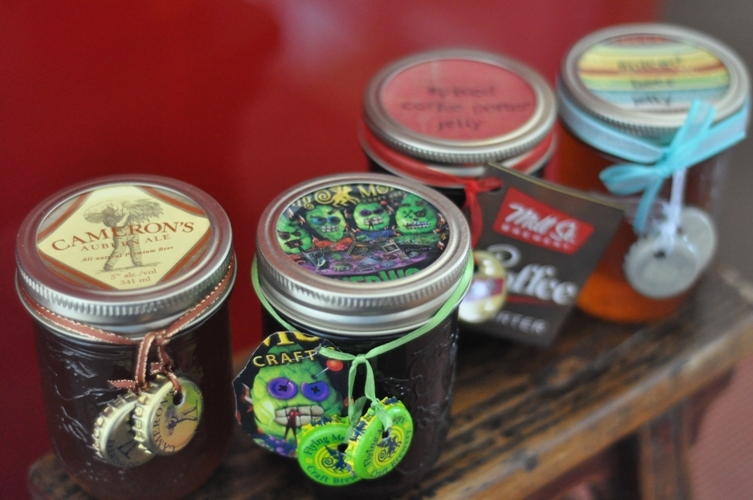 However you decide to dress up your jars remember the options are as limitless as the concotions you seal inside. We’d love to hear from you about how you dress up your jars. 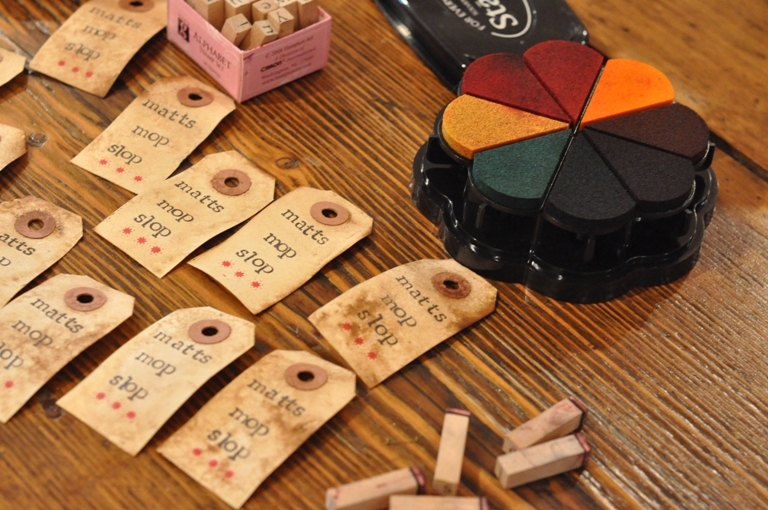 Or, where you get your labelling inspiration from…other sites, art supply stores, photographs? Do you make them or buy them? I really like the idea of using different types of paper and then stamping it. I have a lot of old wrapping paper and some nice scrap book paper to use. I love what you did with the beer jelly! So clever. And I love the idea of using old paper: I save all of the cards I get – between Christimas, birthday, and thank yous, they can add up, so I have tons of cardstock kicking around (I use them to make upcycled gift tags at Christmas time). But maybe I should invest in one of those circle punches…. Oh, and p.s. That embroidered carrot jar top is adorable – but the garlic & rosemary one killed me! I haven’t used any for jar labels but a great source of patterned paper is outdated wallpaper sample books from paint, hardware, or interior stores. Usually they are just thrown out so you can get them for free or a nominal amount. I’m more of a computer labeler myself and designed my labels using the colors and ornament from our B&B’s logo. I use Avery return address labels for the sides of canning jars, regular computer paper for the tops of jars under the rings (i created a template), and sticky project paper for odd sized non-canning jars. What I like about the adhesive labels and project papers is the adhesive they use is easy to remove when the jars are emptied and washed. This is the best blog ever…..and I don’t do canning!!!! Who knows, you might just get me going.